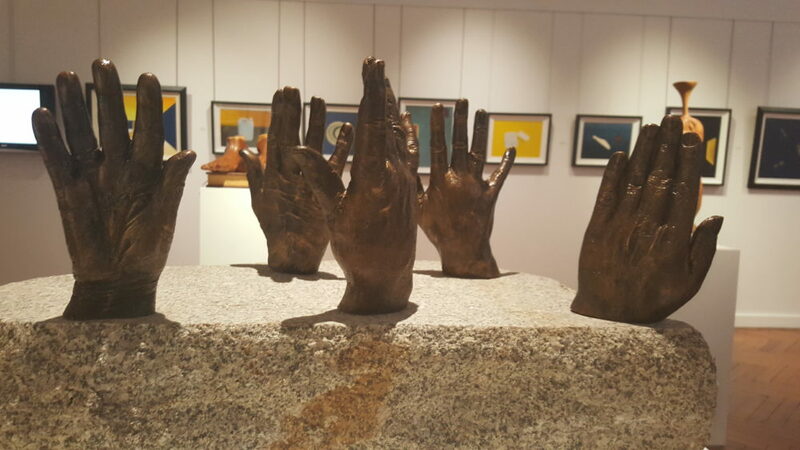 20 years ago the artist Raymond Watson persuaded Northern Irish Political leaders involved in negotiating the Belfast/Good Friday Agreement to allow him to take a cast of their hands. 20 years later these bronze hands can be viewed as part of an art exhibition at the Victoria Gallery and Museum that combines historical artefacts with digital technology and contemporary sculpture. Agreement: A People’s Process explores conflict and the human capacity to reconcile after conflict. In recognising both suffering and peace-building it provides an outstanding impression of the traumas and after-effects of war. It examines the Belfast/Good Friday Agreement, as well as violent conflict in Columbia, Iraq and Argentina. Textiles created in tribute to 360 innocent individuals not involved in proscribed organisations hang outside the exhibition space and act as a touching reminder of the significance and enormity of the scale of lives touched by conflict. 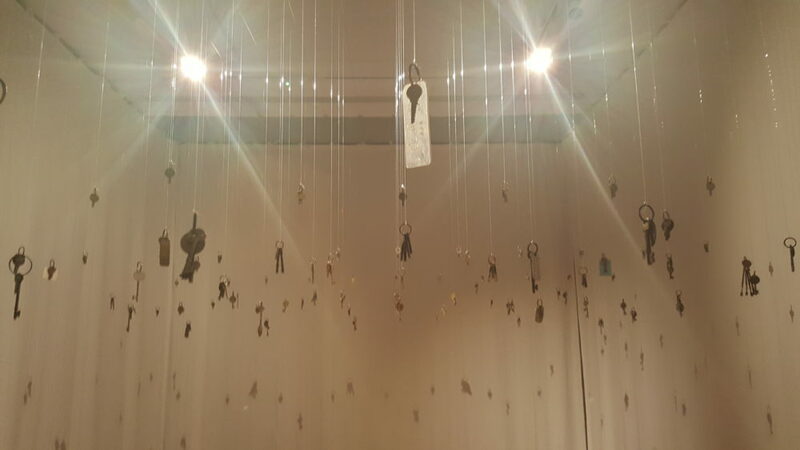 On display in the exhibition are various pieces by Raymond Watson; Hands of Time, a sculpture which makes for the centrepiece of the exhibition, video installation The Grappling Hook, as well as emotive audio installation The Keys. For this exhibition, marking 20 years of peace, Watson has added 20 new bronze hand casts belonging to significant people who played instrumental roles in building and maintaining the peace, such as Bertie Ahern and Tony Blair. In addition, you can see images taken on a smuggled camera by British soldier, LCpl Stan Holman, who died in 1985 from injuries sustained in Northern Ireland and an animated film featuring people of all ages reading excerpts from the Belfast/Good Friday Agreement aloud. Hands of Time is as fascinatingly symbolic as it is visually arresting. The granite stone that makes the base of the sculpture is cut from Mourne Granite, the same material used for the steps to Stormont Parliament Buildings in Belfast. The stone represents a level and common ground to which all of the hands are bonded, as well as a clean slate for building on. The hands protruding from the stone could almost be reaching out for that worldly gesture of friendship and union, a hand shake. Across the hallway from the Hands of Time sculpture sits The Meroe Head of Augustus, an ancient bronze monument which bears remarkable similarities to Hands of Time, not just in material but also in significance. Both exude an overwhelming sense of permanence and timelessness. While the real Augustus died thousands of years ago his likeness lives on. Likewise, it is interesting to learn that some of the men whose hands were cast for Hands of Time have died in the 20 years since the original’s formation. Both sculptures immortalise their subjects. The hands of the people involved with making the Belfast/Good Friday Agreement are, like the agreement, permanent. As you’re walking around the exhibition you might notice distant metallic sounds which go from loud eruptions of noise to quiet and irregular clinks. Follow these enticing sounds and you’ll enter a small ante chamber housing Raymond Watson’s audio installation ‘The Keys’. Stepping through the white curtain into this room you’d be forgiven for thinking you’re entering consecrated ground. The walls are shrouded in white cloth and you’re immediately taken by a feeling of separateness and stillness, apart from the outside world. The keys themselves are historical artefacts taken from the Crumlin Road Goal, a Belfast prison no longer in use. The audio work encourages the examination of imprisonment and places the audience in a thought provoking environment to do so. Whilst in the small space you’re never quite sure where the clanking sounds are coming from, and they seem to emit from the very walls themselves. It’s easy to imagine long corridors and distant keys rattling in the hands of prison guards. Take time to sit in this room for a while and the sounds soon become disarming and unnerving. You’re constantly on the back foot, never knowing where or when the next set of keys will sound and whether it will be a distant noise or loud and close jangling. Perhaps the suffering endured in such prison cells can never be understood or translated, but visiting this audio installation might be a good place to start.